Foreign Policy: Bahrain Spells Trouble For US Policy Bahrain has been marked by unrest this week as the majority Shiite population rises against its Sunni rulers, driving protesters to the streets of this once quiet Gulf nation. Jean-Francois Seznec of Foreign Policy argues that as the body count rises, the United States should be gravely concerned. 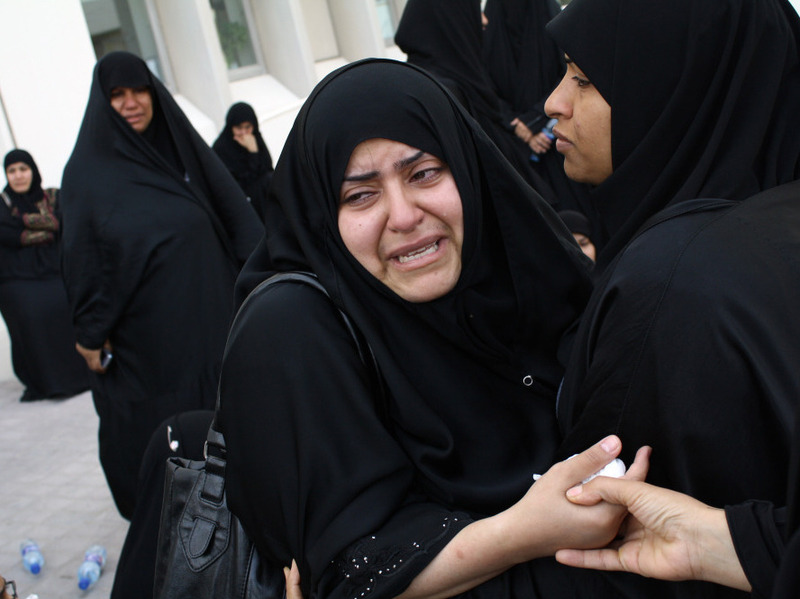 Women weep outside a morgue after at least four people died and hundreds were left injured when police stormed an anti-government protester camp in the capital's Pearl Square on Thursday in Manama, Bahrain. Police cracked down using batons and tear gas, resulting in fatalities and a large number of casualties. Jean-Francois Seznec is a visiting associate professor at Georgetown University's Center for Contemporary Arab Studies. At 3 a.m. on Feb. 17, hundreds of Bahraini riot police surrounded the protesters sleeping in a makeshift tent camp in Manama's Pearl Square. The security forces then stormed the camp, launching an attack that killed at least five protesters, some of whom were reportedly shot in their sleep with shotgun rounds. Thousands of Bahraini citizens gathered in the square on Feb. 15, in conscious emulation of the protesters in Cairo's Tahrir Square, to push their demands for a more representative political system and an end to official corruption. The tanks and armored personnel carriers of Bahrain's military subsequently rolled into the square, and a military spokesman announced that the army had taken important areas of the Bahraini capital "under control." Perhaps alarmed at the recent revolutions that toppled the regimes of Egypt and Tunisia, the Sunni ruling family in Bahrain has been taking no chances against its young and mostly Shiite protest movement. Bahrain's King Hamad bin Isa al-Khalifa has been able to overcome past troubles by posing as an enlightened autocrat, willing to show leniency. But divisions within the monarch's family, which he relies on to maintain his authority, may be forcing the king into a harsher position. And that spells trouble for Bahrain's stability, as well as the country's halting reform efforts. The United States has a considerable national security stake in what goes on in this tiny island kingdom. Bahrain is home of the U.S. Navy's Fifth Fleet, which protects the vital oil supply lines that pass through the Persian Gulf and the Strait of Hormuz — an important asset for the United States in the event of a conflict with Iran. Bahrain is also a key logistical hub and command center for U.S naval operations in Iraq, Afghanistan, and the Indian Ocean. For the past few years, quasi-Salafist and arch-conservative elements of the Khalifa family have been gaining power over more liberal members of the family, who advocate widening the economic and political involvement to all spheres of Bahraini society. Prime Minister Khalifa bin Salman al-Khalifa, the oldest and richest member of main ruling clan, has emerged as the leader of these conservatives, who seek to ensure the Khalifa family's continued stranglehold over the politics and economy of the country. His resignation has become one of the protesters' primary demands. While the successful mass protests in Egypt and Tunisia clearly inspired the protesters in Manama, trouble has been brewing in Bahrain — which is divided between a Sunni ruling family and a majority Shiite population — for years. Skirmishes broke out between young Shia Bahrainis and police forces last March, and political dissidents were arrested in the run-up to the Oct. 30 parliamentary elections. The growing influence of the more extreme Khalifas was on full display during the Feb. 17 police crackdown. The police force that raided the camp is legally under the control of the prime minister. The brutality with which the raid was conducted may have been a bid to create a state of emergency on the island, forcing the more liberal members of the family to side with them against the protesters. It is not only the Sunni ruling family that is divided — the Shiite opposition parties are also split. The al-Wefaq party is the largest opposition party in Parliament, but its support among Shiites has declined due to its failure to win any concessions from the leadership on the issues of increased political power and representation or economic opportunities. As a result, the more confrontational al-Haq movement has been taking to the streets to wrest leadership away from al-Wefaq. In the past year, reports that al-Haq members were arrested and tortured by the security forces only bolstered its popularity among the Shiite youth and unemployed. According to some Shiite leaders, al-Haq now is seen by a majority of Shiite as the leading group of the community. The efforts of the demonstrators to reject violence — noble aspirations supported by the majority of Bahrainis — may represent an attempt by al-Wefaq to take back leadership of the opposition from the more confrontational al-Haq. The October 2010 elections to the Majlis al-Nawaf — the lower house of Parliament — were expected to bring some stability to the country. Al-Wefaq won 18 out of 40 total seats, and the election was relatively free and fair (though some constituencies were gerrymandered to ensure that al-Wefaq did not gain a majority). What's more, the influence of some of the more extremist Sunni groups was undermined by centrist Sunni-Shiite alliances. However, these hopes were dashed by Parliament's inability to affect real change in the country. All its decisions can be negated by the Majlis as-Shura, whose members are nominated by King Hamad. And the king can also veto any parliamentary decision. The sectarian divide that has emerged in parliament over the past three elections has also meant that most issues, such as the public availability of alcohol, the segregation of sexes in schools, are framed in purely religious terms. This has led the public to see parliamentary action as mostly irrelevant to their lives, increasing the pressure for citizens to take to the streets. These particularities of Bahraini politics aside, it is clear that the present mass demonstrations are trying to follow the nonviolent example set by their counterparts in Egypt. The current wave of protests originated from 14,000 young people on Facebook. They represent a new generation, fed up with the impasse between the al-Khalifa clan and the older Shia leadership. The chant today on the street is: "No Sunni, No Shia, just Bahraini!" This is a message that the Khalifa family, and the U.S. government, would do well to take to heart. Anyone who has traveled to or lived in Bahrain knows that Bahrainis — both Sunnis and Shiite — see themselves as Bahraini first, not stooges of Iran or Saudi Arabia. Some, of course, are influenced by Tehran or Riyadh — but by and large citizens are influenced by what happens in Manama. The Khalifa family has skillfully drawn on Western fears of the Shiite as tools of Iran, which has so far obtained unquestioned U.S. support for their continued rule. Secretary of State Hillary Clinton's mealy-mouthed statement today, in which she called for the government to show "restraint," is further evidence of this fact. Her remarks will not sway the prime minister and his cohorts, nor will they convince the demonstrators that the United States is a defender of their rights. In the absence of real reform, the Iran threat could become a self-fulfilling prophecy. If the Khalifas are not able to open up the state to their own citizens, the more extreme Shiite leaders could start to see Iran as a protector, and a curb to U.S. and Saudi influence. And a turn towards Iran would likely bring Saudi intervention in support of the monarchy. The Khalifa leadership is faced with the choice of truly liberalizing or risking outside intervention — which would mean a grave loss of their position, and a potential catastrophe for the United States as well.